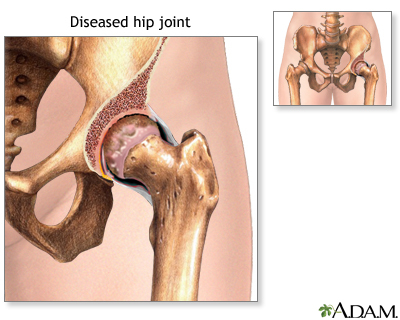 Hip Joint Replacement or Total Hip Replacement is surgery to replace all or part of the hip joint with an artificial device to restore joint movement (a prosthesis). Updated by: Brent Wisse, MD, Associate Professor of Medicine, Division of Metabolism, Endocrinology & Nutrition, University of Washington School of Medicine, Seattle, WA. Also reviewed by David Zieve, MD, MHA, Isla Ogilvie, PhD, and the A.D.A.M. Editorial team.